Earn up to 40% Commission ! Earn upto 40% per Sale! Elite affiliates will receive higher commissions. 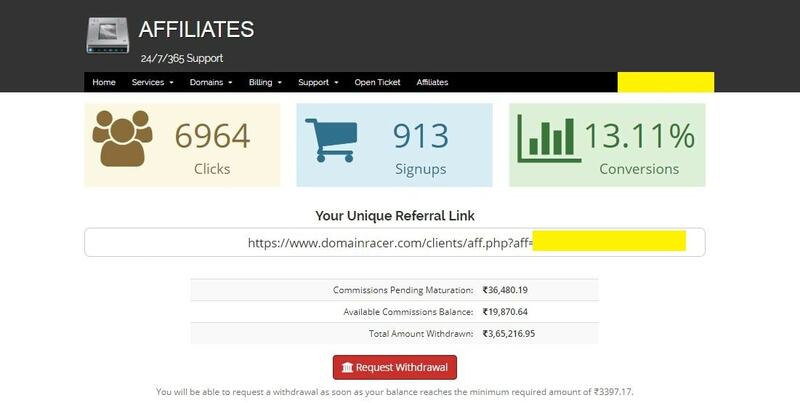 DomainRacer affiliate payout ASAP on request. Why DomainRacer is so good? Highest Conversion Rate with 13.11% (Mar 2019) & Lowest Customer Refund rate 0.24% (Mar 2019). Means seemless earning opportunities and slab based commission structure to suit your profession. Refer consequetive 2 month leads i.e. 20+ lead = $50 & 40+ leads = $70 Earn a $200+ Other Bonuses for referring 50 or more sales to DomainRacer! We will offer you marketing base to get more referral. Also we will send different promotional techniques and proven strategies to start with Affiliate program. Simple Commission Structure !! Increase Leads based on Slab and get upto 40% Affiliate commission right a way. If you want to make money quickly, the best way to do it is by joining an affiliate program. Instant Approval & affiliate program is completely free of charge. Surely you will earn the highest commissions in the market - up to 40% per sale. The cookie placed in your visitors website lasts 60 days. If during this period referral makes a purchase and doesn’t cancel within 30 days, you get commissions. Process is very simple, Write Blog Article about DomainRacer, Spread words on social media like facebook, twitter. Join Discussion forums, Q&A Sites, and leave you affilate link. We have average conversion rate per 100 visitor is 5 to 10 customers. Where can I promote DomainRacer? Yes, You can. Commission earnings, tracking and payments are updated instantly in your Affiliate Panel. We pay commission by PayPal on request in US dollars, and side by side the total commission balance must be greater than $50.00 USD. Referral which request refund for any reason will not be paid. No unsolicited bulk e-mail traffic, no blind redirects, or other malicious advertising will not accepted. Affiliates may not represent themselves as DomainRacer on any search engine or advertising platform. There is a $100 minimum before you can cash out. Affiliates need an active & verified PayPal account. If payment revert back then affiliate will need to pay penalty due $5.